Although he defended the use of derivatives in general, Mr. Greenspan, who left his post in 2006, told members of the House Committee on Oversight and Government Reform that he was “partially” wrong in not having tried to regulate the market for credit-default swaps. The responses from the panel were met with little sympathy from Representative John A. Yarmuth, a Democrat from Kentucky, who likened the three witnesses to Bill Buckner, the former first baseman for the Red Sox whose notorious error cost his team the 1986 World Series. Congressman Yarmuth has it almost right. I would put it a bit differently. Instead, I would describe it as pulling the player from the field and letting the free market deal with the ball. Alan Greenspan's error was not missing the ball, but thinking he didn't need to pay attention to the ball in the first place. Update: I have more on the end of the Greenspan error over at the Guardian. Yes Barack Obama is up in the polls, but haven't we been here before? Weren't we optimistic last time? MyDD has posted a useful comparison with 2004. This time four years ago, Bush led in three polls, Kerry led in two, and three others were tied. only 6 points, down 2 in armed forces households, 3 among investors, and is tied among NASCAR fans. Tied among NASCAR fans? This really could be big. I know; we can't get complacent. If you think Obama is going to win then perhaps you can find motivation in the nasty campaign being waged. Or perhaps the fact that McCain is still fighting in Pennsylvania will motivate you to keep working for the last two weeks. I know plenty of folks from Delaware who are heading up to Pennsylvania to volunteer. 50 percent plus one is enough to win an election, and the Electoral College map looks pretty strong, but we should be looking to do better than the minimum necessary. Should they win, Barack Obama and Joe Biden will have to govern, and a strong win would make that easier. To get involved, you can visit the Delaware for Obama web page or call (302) 428-1615. In the late 1990s, Charlie co-founded the non-profit Challenge Program to provide vocational job training to at-risk youth in New Castle County. In the 13 years since the program has been in existence, dozens of disadvantaged youth have learned tangible job skills that are benefitting [sic] them as they go through life. In 1997, 5 years before first deciding to run for public office, Charlie co-founded the Challenge Program, a Wilmington-based vocational-training program for at-risk youth in the city. The Challenge Program originated by offering small craft workshops to at-risk youth in 1995. Since then over 700 students have built and learned to paddle small boats at our Wilmington boat shop. Once a part of the Kalmar Nyckel Foundation, the Challenge Program obtained a separate 501(c)3 designation and a dedicated board of directors in 1999. While it is true that he serves as the president of the board, the program had already been running for two years at the time Copeland claims to have founded it. But I don’t have to refer to a couple of websites to refute his claim. I am personally familiar with the creation of the Challenge Program, which was founded in the 1990s by a good friend, and then Winterthur wood conservator, Mike Podmaniczky. I was working in city government at the time, and Mike came to me for advice on how to get started. The program was initially called The Challenge at Fort Christina, and was absorbed into the Kalmar Nyckel organization within a year or so before being once again spun off as a separate non-profit. A master craftsman was brought in to teach boat building as a way to develop carpentry skills. I am pleased to see that the program has continued with Mike’s original vision of involving city youth in developing the craft of woodworking. They do stunning work, in contrast to the more usual practice of training folks to hang sheetrock. Charlie Copeland can be commended for supporting the program and serving as board president. That’s what wealthy people should do in our society. But my friend Mike, who is still listed as a board member, deserves the credit as the true founder of the Challenge Program. Even the original logo, the sketch of a wooden boat frame, dates back to his creation of the program. Charlie Copeland has made his role in the program a centerpiece of his campaign, particularly in the City of Wilmington. If Copeland said he simply led the program, I would not give the matter any thought. But his claim to have founded the Challenge Program doesn’t hold water. Colin Powell's endorsement will have three important effects on the campaign. First, and most immediately, it will shape the news for the next several days, and will interrupt the McCain campaign's message for the better part of the week. Beyond that, I can see the media repeating Powell's criticism of McCain's campaign, particularly on foreign policy and the pick of Sarah Palin, between now and election day. 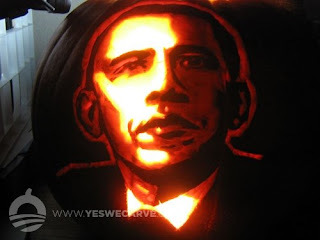 Second, it reinforces the message that Obama is a safe choice for president. I can think of no more credible authority to deliver the message that Barack Obama is better qualified to lead the country. Third, it helps Obama with military families in states like Virginia. Not all military families are supporting John McCain; more than a few are unhappy with the way the military has been used in the pursuit of neocon dreams, and don't want to see the same ideology expressed in a McCain presidency. I don't think Obama will see a bump in the polls because of the endorsement; he's probably at close to the maximum of public support. I do think it will make it harder for McCain to gain back much ground in the two weeks remaining. Again, these arguments have "worked" for a long time. The Democrats who got themselves elected President during most of my career were those most successful at playing defense: No, no, I'm not going to do any of those things! And so the first reaction of more than a few talking heads last night was that McCain had done better, maybe even won, because he had made those arguments more successfully than he had in the first two debates. He thought that merely invoking the magic words "spread the wealth" and "class warfare" he could neutralize Obama. But those words and phrases seem anachronistic, almost vestigial now. Indeed, they have become every bit as toxic as Democratic social activist proposals--government-regulated and subsidized health care, for example--used to be. We have had 30 years of class warfare, in which the wealthy strip-mined the middle class. The wealth has been "spread" upward. It's been a while since this argument has worked. Ronald Reagan was elected 28 years ago. Income tax rates were cut significantly in the 1980s and have never threatened to rise again to the levels seen in the bad old days. Middle class incomes, which rose in the Clinton years, have declined since 2000. Instead of spreading wealth, we have seen it increasingly concentrated. With home values and retirement accounts dropping as well, it's hard to see voters switching back to McCain at this late stage in the campaign. I do expect the polls to tighten a bit in the next two weeks for two reasons: First, there's the phenomenon of reversion to the mean, which put another way states that Obama's numbers can't go up indefinitely. Second, the McCain campaign can't get much worse, which means any plausible argument is likely to be an improvement over the chaos of recent weeks. If McCain's number do improve, I expect that Republicans grasping at straws to exclaim that they have finally found a winning argument and bombard us with endless allusions to Joe between now and November 4. When after the Republican convention, Obama's poll numbers momentarily slipped behind McCain's, panicky Democrats urged him to get mad. He did precisely the opposite. He got calm. While critics derided his reserved demeanor and wondered why he didn't land any knockout punches in the first debate, Obama knew all along what that what he needed to do was not put on an entertaining fight but offer reassurance in troubled times. You'll hear the booing behind me. In recent days, when Barack Obama's name has been mentioned, it has gone from boos and hissing to actual chants and calls of traitor, criminal, and even terrorist. The McCain campaign says they don't condone it, they don't want to see it happen, but it's happening more and more every day. Nate Silver of FiveThirtyEight calls it "a sad denouement for what was to be a high-minded campaign focused around themes of honor and reform." The irony here is that, for so many months, the campaign being waged by Schmidt & Co. was viewed by the press as devious, sure, but deviously brilliant, delivering to McCain innumerable victories in the battle for the daily—and even hourly—news cycle. McCain may have won some news cycles, but he is losing the contest of the meta-narrative—and with it, perhaps, the election." What will it profit a candidate if he gains the news cycle and loses the election? It's hard to change voters' views when changing tactics so frequently. 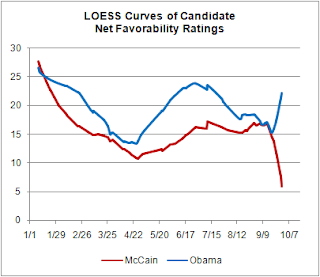 But the problem for the McCain campaign is even more fundamental. David Kuo writes, "John McCain has no real idea why he should be president." McCain "knows that he has grueling contempt for his opponent" and "is a better, more tested man," but on policy "is intellectually, philosophically, and politically vacuous." Voters who look at campaigns for clues as to how the candidates would govern, are not being reassured by McCain's increasingly angry demeanor. He could hardly bear to look at his opponent in the first debate, and dismissively referred to him as "that one" in the second. While his campaign is trying to shift attention to Obama's character, voters increasingly like the steady cool of the young senator compared to his older colleague. It will be even more difficult for John McCain to bring his opponent down a few notches while restoring the luster to his already tarnished reputation as a bipartisan maverick. The McCain campaign will have a lot of scorched earth to cover in the next 25 days if they want to turn this around. In a losing campaign, there comes a time when a candidate faces the decision of whether to go negative. I've been involved in winning and losing campaigns, and I am pleased to say that the candidates I have worked with never chose to get nasty. I have seen the impulse to start slinging mud restrained by candidates' better angels, as well as the cold reality that it probably wouldn't make any difference. It's one thing for a hockey player to start checking harder or for a lineman to grab his opponent's jersey in a close contest. But it's another thing to get dirty when the game is effectively out of reach. So what is Bill Lee, who is down by thirty points, doing putting up trashy hit-piece website with less than a month to go? The website, called therealjackmarkell.com, comes complete with the obligatory grainy black and white photos, and dredges up an old shareholder lawsuit against Nextel that was settled after Markell left the company. Hey, if these guys want to remind people that Jack Markell helped build a Fortune 500 company, well good for them. The site also offers overheated language about the "skyrocketing budget" of the Treasurer's office, and offers some pages from different budget bills as evidence. A quick review of the evidence presented reveals that most of the budget increase was due to the debt service the Treasurer's office manages, not the operating expenses of the office. The people who cooked this up either don't know know what they're talking about or don't care, which is fine, because they probably won't be working in state government anytime soon. I really shouldn't care about this crap, because Jack Markell is going to win by a mile. But having worked in government and politics, I have these old-fashioned beliefs about acting with integrity in the public sphere. Ralph Stanley: Howdy, friends. This is Ralph Stanley, and I think I know a little something about the families around here... ...and after the last eight years - I know we all need a change. Nobody's looking for a handout, but I think we could use a leader that’s on our side, and that leader is Barack Obama. Barack'll cut taxes for everyday folks - not big business -- so you’ll have a little more money in your pocket at the end of the year. He understands that our kids shouldn't have to leave our communities to find work...that's why Barack will make it easier to send your children to college and help create 5 million new jobs by investing right here at home. So, please join me, Ralph Stanley, in supporting a true friend of the people who live right here in Southwest Virginia. Barack Obama is the change we need. BO: I'm Barack Obama, candidate for President, and I approve this message. Narrator: Paid for by Obama for America. When it comes to issues like crime, Afghanistan and the right to privacy, he is more than happy to show you that he knows his stuff. But I also think he may talk a bit about the Biden family values, as he did in his speech at the Democratic National Convention: "You know, my mom taught her children - all the children who flocked to our house - that you're defined by your sense of honour and you're redeemed by your loyalty." I certainly expect him to find a way to mention his son, Beau Biden, Delaware's attorney general, who is shipping out for Iraq as a captain in the Judge Advocate General Corps. He might do it by offering kind words for Track Palin, who is also being deployed to Iraq. Yes, Biden can expound at length on policy. But he has been known to lay it on pretty thick when it comes to the Biden clan, and show that Democrats have family values too.